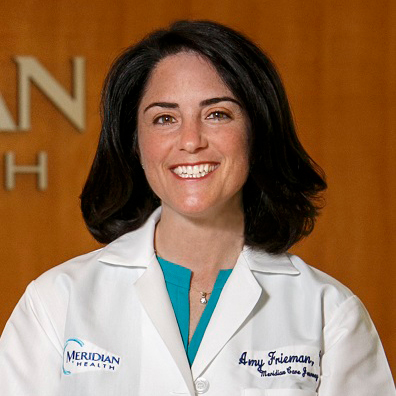 Dr. Amy Frieman is the Corporate Medical Director of Palliative Care Services for the legacy Meridian Health System, part of Hackensack Meridian Health (HMH) in New Jersey. Dr. Frieman attended medical school at the University of Missouri in Kansas City where she graduated in 2000 with highest honors. She went on to complete her internship and residency in Internal Medicine at The Mount Sinai Hospital in New York City. Following completion of her residency, Dr. Frieman remained on the faculty at Mount Sinai where she later obtained Board Certification in Hospice and Palliative Medicine. Serving as an Assistant Professor, Dr. Frieman educated medical students and residents about palliative care while providing primary and palliative care to a homebound population as part of Mount Sinai's Visiting Doctors Program. Dr. Frieman's academic career included a special focus on burnout among medical residents and the intersection of medicine and the humanities. In 2010, Dr. Frieman joined Meridian Health as Medical Director of Palliative Care Services. She served as the Medical Director of a very successful Medicare Demonstration Program that brought palliative care into the home for more than 3700 patients. In her role as Corporate Medical Director, Dr. Frieman has expanded HMH's palliative care services across the continuum of care to include the inpatient, skilled nursing facility, outpatient and home settings, and in 2016, the program was awarded the American Hospital Association's Circle of Life Citation of Honor. Dr. Frieman is a Clinical Assistant Professor at the Rutgers Robert Wood Johnson School of Medicine. She serves on the Center to Advance Palliative Care's national Home-Based Palliative Care Work Group, the statewide NJ Practitioner Orders for Life Sustaining Treatment (POLST) Steering Committee as well as the New Jersey Hospital Association's End-of-Life Advisory Committee. Dr. Frieman is a fellow of the American Academy of Hospice and Palliative Medicine (AAHPM) and was also named an Inspirational Leader in Hospice and Palliative Medicine Under 40 by the AAHPM. It's a fact of life, yet one of the facts most difficult to come to terms with. What's best for our grandparents, parents or ourselves, and what steps are needed in advance to ensure comfort at the end of life? The answers you're seeking will be shared in this session.